Today started the “12 Deals of Christmas” at the ski resort; this first one was $1 off slices of pizza upstairs at the day lodge. I would have been more excited by this if the pizza were more like one of my four favorites from the Great Lakes States. Growing up in Chicagoland, I was raised on thin crust pub cut pizza (possibly because this style reminded my parents of what they’d had back in Wisconsin before moving down to Illinois). Sausage, cheese, and mushroom were the only toppings I ever remember my parents getting for us. I don’t think I had pepperoni until I was in high school. The place we frequented when I was little is still in business, just in a new location across the river from the old one. 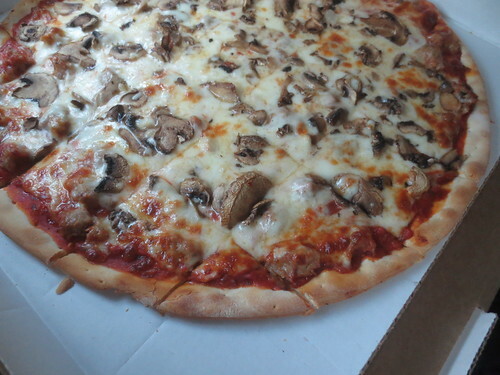 When I’d visit my mom, I’d often get a pizza from there for us to share (usually sausage, cheese, and mushroom, of course). Even though they’d deliver, pickup was what we’d done when I was little, so pickup was usually what I’d do as an adult, too, driving back to Mom’s house tempted by the warm, fragrant box sitting next to me on the passenger seat. Living in Detroit as a grown-up, I favored pan pizza from Buddy’s (those corner pieces especially) and Pizza Papalis. The latter had a counter at the airport in Detroit for a while, and sitting down with a personal size pizza after I’d made it through the TSA gauntlet was such a nice way to spend the time before boarding. I was so sad when they closed down. Because my family were thin crust people, I didn’t have the Chicago-style deep dish hardly ever when I was growing up. As an adult, I’ve been remedying that situation with regular doses of Lou Malnati’s when I’m back in Chicagoland (and not otherwise engaged in culinary reminiscence in the form of thin crust from my childhood place). We have, on more than one occasion, transported multiple frozen pies from Malnati’s from Illinois to Idaho. Worth it. The pizza I’ve experienced in Idaho, including the slices on special in today’s deal, is more New York style, with big floppy slices. I will eat big floppy slices, but they are not my favorite. Thus today I skipped the deal and came home and made myself a grilled cheese and tomato sandwich while waiting for the person to come and look at our internet, which is now working, going on four hours in a row now. Fingers crossed it stays that way.